The latest energy generation/use chart for the US is out. Sinks and source, plus general field of use--it's a fascinating chart, and I hope it gives you a sense of where real solutions to the energy issue lie. Let's work on the efficiency issue. 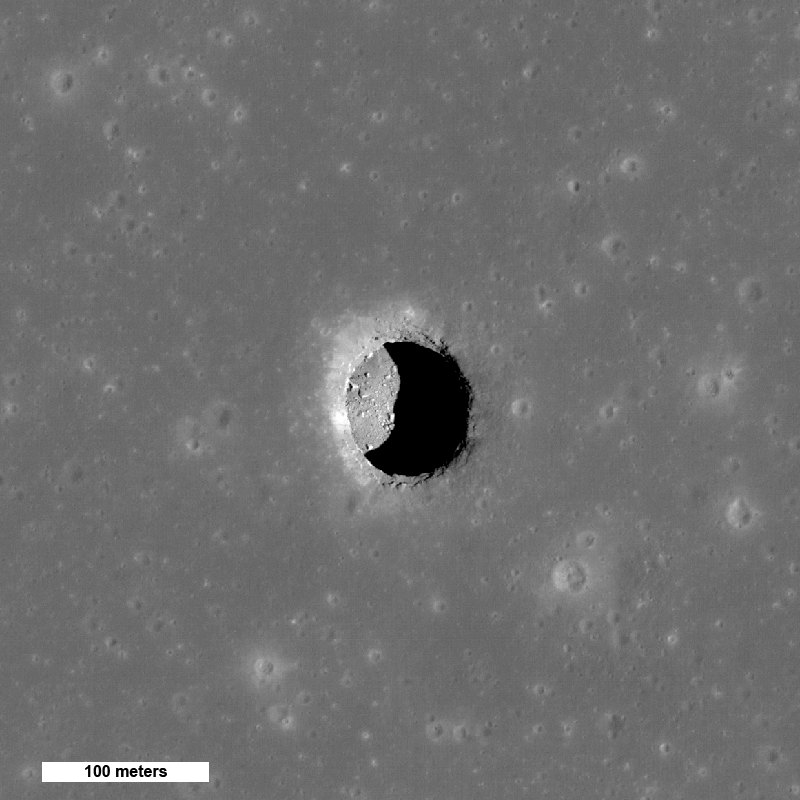 My first thought once it was confirmed was "What is the real rate of visible Jovian impacts versus our sampling rate of looking for them?". Haze and smoke visible in on the visible satellite image for this afternoon might give the less humid weather the next few days in Chicago a tinge of non-clarity. Hey, this is pretty cool; I'm always a fan of planetary conjunctions. Saturn was visible in a few of the images of Lutetia taken by Rosetta as it passed by! 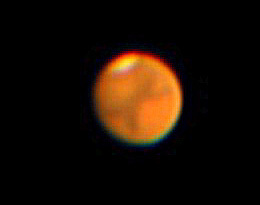 Old Mars photos from 2003: No, it's not going to be big in August. 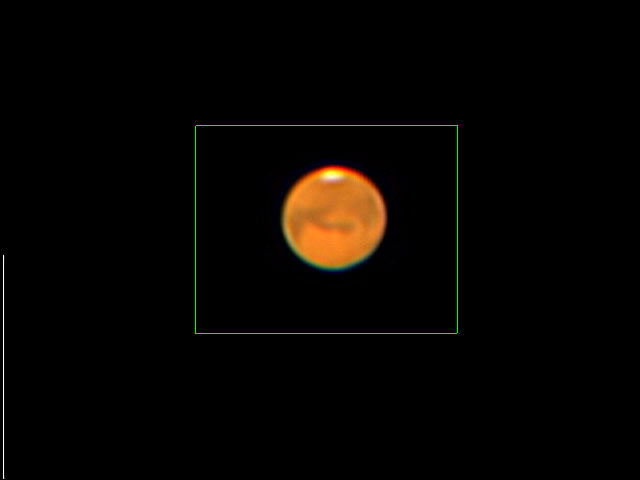 Inspired by a query regarding the false meme going around about Mars, I took a look at some images I took of Mars during it's big opposition in 2003. That was a great opposition. Here's a couple of those images. The first one is a single image without manipulation, the second and third are Registax processed images from videos, and the last is one of those videos. Mars at the moment is not approaching one of those awesome 17 year oppositions like 2003 or 1988. It's just fading away from its January opposition and currently visible in Leo in the evening. In my high school days I had a part-time job at a professional photo lab / studio called "Phillips' Photo Lab". I was hired as the black and white darkroom guy--I manually processed film, printed custom prints, shot copy negatives, and cleaned the color film and print processors. Later I branched into running the shop on Saturdays and once, just once, did a color print job. I learned a lot from the pros whose lifeblood was photography: the tips and techniques that make life easier. One of the things that I would not had believed unless I had personally experienced it was the magic of nose grease. The skin on the nose and to a lesser extent the neck near the back of the ears produces a hydrocarbon of about C30H50 called squalene. The only reason this is important was squalene had the same index of refraction as the gelatin used in photographic processes and hence could be used to fill in scratches on negatives and slides. You would acquire some nose grease, rub it gently into the scratch, and rewash the negative. Nearly as good as new, and it allowed prints and reproductions from otherwise damaged negatives. This particular example is this blog's first mention of a principle I like to call "matching impedances". In the world there are a lot of interesting issues that in the end are solved or mitigated by taking two different systems and making them the same at the point they meet. 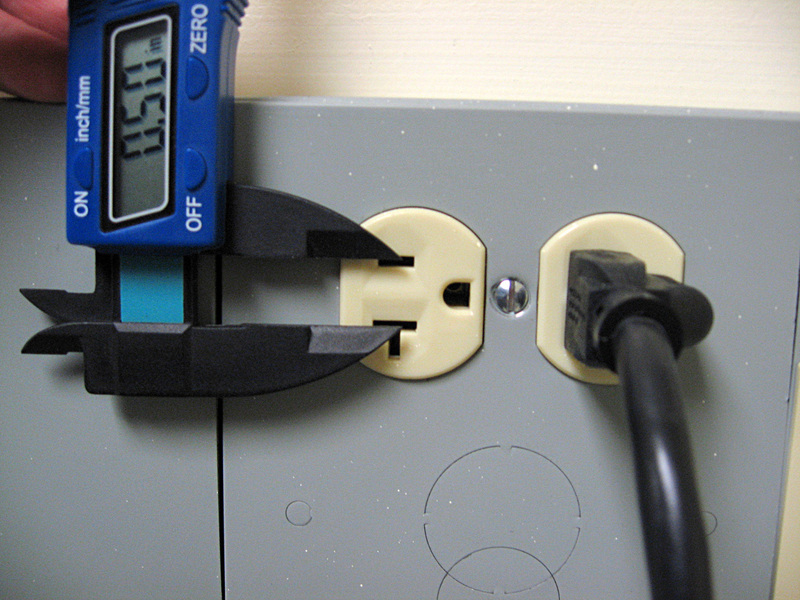 In electronics, to maximize power transfer between two parts of a circuit, you match their electrical impedances (which is a function of their resistance at all frequencies). You have encountered this when setting up a TV or stereo system; the speakers have an impedance rating on them, usually 8ohms for a home stereo and 4 for car audio. Your amplifier speaker outputs need to be designed to deal with a particular impedance; stick a 4ohm speaker on an amp designed for 8 and you might mess things up. On your TVs there used to be two terminals for antennas--one was coaxial and had an impedance of 75ohms and is now the de facto standard, and the other was two screws that had an impedance of 300ohms. To get the most signal you'd want all the impedances to match up: the TV, the cable, and the antenna. If they didn't, part of the precious signal would be reflected back towards the antenna and lost. For converting the impedances to match a little transformer was used, of which there may be a hundred million hiding behind the TVs of the world. Again, here the principle of matching the impedances came into play. In the optical world reflections occur at surfaces that have differing indexes of refraction. The bigger the difference the higher the reflection ( I think it's a square of (n-n2/n+n2). For solar panels, for instance, the high index of refraction of silicon (4) compared to air (1) makes something like 50% of the incident light reflect off unless you use anti-reflective coatings to improve it. 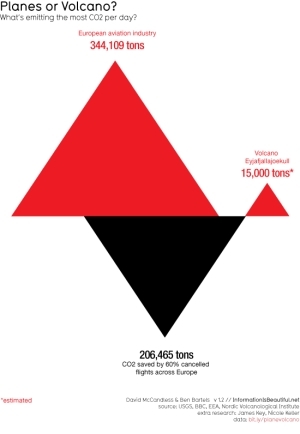 So even for something like a renewable energy resource you have to consider such details. I use nose grease (n=1.45) to also try to fill in scratches in CDs/DVDs (made of polycarbonate, n=1.58). It's not perfect, but sometimes it makes it playable. So, in the end: Match your impedances! The Japanese spacecraft Hayabusa will be returning to Earth with perhaps a sample of the asteroid Itokawa in just four days. This spacecraft has had as many setbacks in the seven years it's been running as you can have without losing the craft completely. When they released the data archive in 2007 I made a color image of Earth made by Hayabusa during a flyby and some more surface close-ups here. It's midnight in Iceland and nearly midsummer with a volcano erupting, what do you do? Hang out in front of the thermal camera. 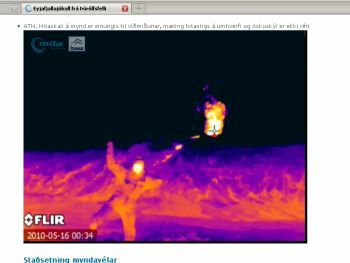 There are several webcams watching the Ejyafjallajökull eruption; and at this time of year the plume is illuminated all the short night long. I watched the sunset at 10:30PM and am now watching the sun rise at 4:30AM. The eruption continues through the Arctic summer night. 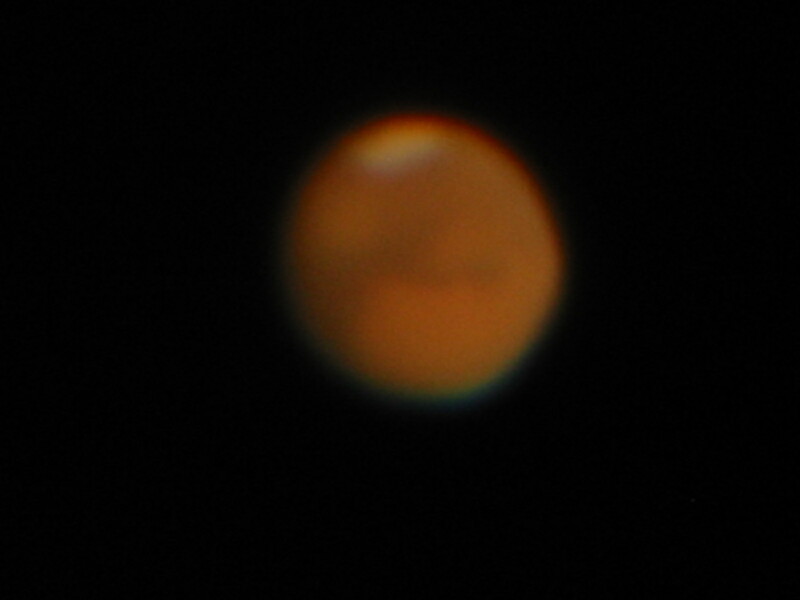 This one is closer and has a thermal IR camera as well; but it's also more often obscured by ash and fog. Jupiter's South Equatorial Belt, normally a brown-red, has gone as pale as the cream white zones surrounding it. Check out the report with images at the Planetary Society Blog: http://networkedblogs.com/3Jnoh. This is one of those things that happens every 5-10 years or so. You can just pick out the ice sheet from underneath the clouds. The NY Times Lede blog has linked to BBC Channel 4 video of the eruption. From the look of it, the videographer had one of the many excursion drivers take them up Thórsmörk (or Þórsmörk) valley on the north side up high enough to look at the eruption without dealing with the jokulhaup (or glacial flood) in the river. If you have ADD you will miss the active sub-Plinian eruption and great lightning in latter half of the video. 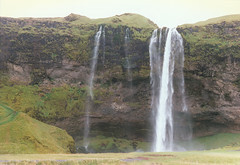 UPDATE: the waterfall at the beginning is Seljalandsfoss. I have a photo of it here: http://www.flickr.com/photos/dwarmstr/4532063271/. Soichi Noguchi captures a poignant moment as the Shuttle leaves the International Space Station. Click to enlarge to a higher quality image. I was just reading about the Eyjafjallajökull eruption yesterday and the rather bold tourist enterprise sprung up to visit it, when I see it has erupted in an explosive manner. The new path to the surface for the magma opened under the ice sheet (jokull) instead of bare ground, and water/magma interactions produce copious amounts of gas. Gas is a bad thing when it comes to magma. It makes thing go boom. Instead of a lava fountain and a tourist stop in Iceland, now we have flooding as the glacier melts, and air travel restrictions as the volcano generates large plumes up into the atmosphere from the phreatic eruption. 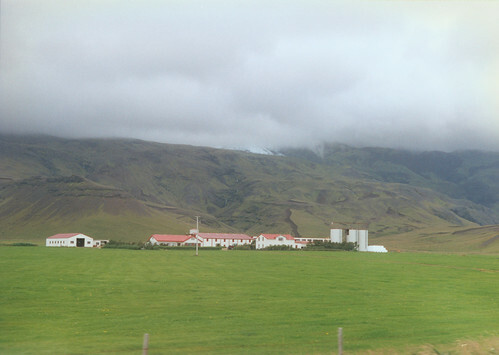 The Icelanders are concerned about the flooding and the fluorine from the ashfall. For the geology, the composition of the magma (how much silica is in it, how much gas is in it), its interaction with the surrounding rock, and how the magma changes in composition as time increases are the interesting things. For the British sitting waiting for the air to clear, realize that ash is just magma pulverized through explosive means. Blame the gas. Here is some good information on the location and the inflation/deflation data. I've been unable to get the DOS software AW-SRAD to work with the geiger counter for some time, on multiple machines, with Windows XP. It's a bummer. I can input the sound pulses from the clicker unit I made into a sound card, but I have no idea how to then get the PC to do something with that. I'm not a programmer. The original geiger counter set up was really simple: it toggled the RING indicator on the serial port. Amateur photographers, happy to accept small checks for snapshots, are underpricing professionals. I made some comments about this issue last year in this post: http://dwarmstr.blogspot.com/2009/06/intersection-of-onlinesharing-culture.html. Since then, I made that Faustian bargain of getting an image of mine on a book cover without payment save a few copies of the book (although I haven't gotten them yet, CRC Press). The publisher said they had no budget for images, it would likely sell very few copies (a very technical book), etc... should I have done it? Conversely, if you are a corporation, why shouldn't you find free or cheap photography instead of paying for it? Photography has been freelance for sometime, and never unionized that I am aware of. It might actually be clear! This is great; I've been holding off on sharing this because I felt like it was too special to share widely. But here's the deal--there is a live video feed on the International Space Station. And usually it's pointing out at Earth. So literally you can watch the Earth go by live. You can experience sunrise and sunset in orbit. You can see the biggest cities' light pollution on the dark part of the orbit and sun glints of the Pacific or the swirls in the clouds in the Southern Ocean. Here's the Live ISS video feed. If you stop the video, reload the page rather than restarting the video; otherwise regular NASA TV will start up. There are some parts of the orbit with no video download. It is also sensitive to the TDRSS capacity. While writing this, I am watching sunrise on the ISS just south of South Africa. It is beautiful. I can't stand anyone running cloud video footage in reverse. This drives me crazy; whether it's my physics and chemistry of the atmosphere classes or just my sensibilities but whenever I see it it drives me crazy (c.f. Survivor this season). If the cloud droplets are evaporating or condensing the wrong way, anyone with meteorological experience (or someone who has watched Koyaanisqatsi) will call shenanigans. 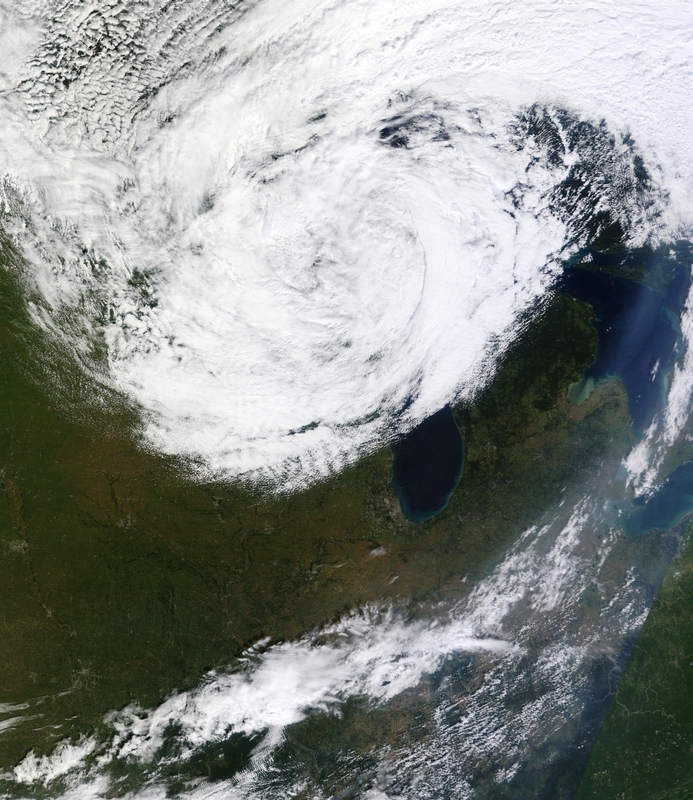 Convection has a distinct look to it; as well as evaporation; and when producers try to reverse the video it shows. Sun Dogs are bright refractions of the Sun coming from horizontal ice crystals in the atmosphere. The ice crystals are usually oriented horizontally because that it their stable falling pattern. Watch as the rocket carrying the Solar Dynamic Observatory pierces through a cirrus cloud and the sound waves from the rocket completely obliterate the preferred ice crystal orientation. 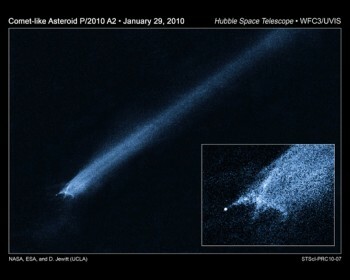 Color me surprised: I did not believe, when this object was first reported, and further debate on the Minor Planet Mailing List, that this was in fact a collision. The bright orange "star" next to the Full Moon tonight and Friday is the planet Mars, which happens to be closest to Earth tonight (ok last night) during this current cycle (Mars and Earth come close to each other every 2 years and 2 months). And closest in only the sense of currently: it's still 99 million kilometers away. 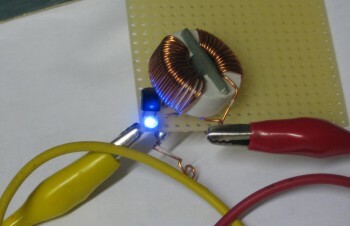 A joule thief circuit lit from a 0.5V AAA battery. Click to enlarge. A Joule thief is a simple circuit that acts as a DC to DC booster, raising a supply voltage by several volts. In this iteration it uses the exhausted voltage of a alkaline battery and boosts it enough to light a blue LED that requires 2.8V to light. With an otherwise dead 0.5V AAA battery, it will light a blue LED and run for days, using (at the moment) just under 2mA of current. It's much much dimmer than using a fresh battery or running the LED with a proper current through it. Giving the Joule thief circuit 3V from two fresh batteries pulls 75mA through the LED, making it very, very bright and probably short-lived. A schematic is below. The circuit works like this: When first turned on, current flows into the inductor and produces a magnetic field in the toroid. 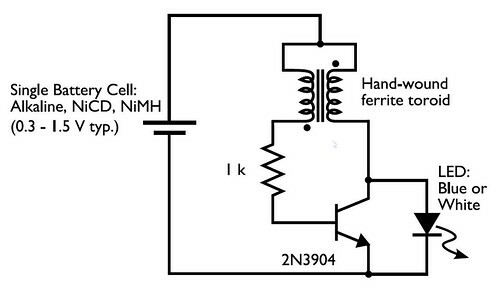 While this is happening, no voltage appears at the base of the transistor, so the transistor remains off. The LED sees at first no voltage and while the inductor fills up, it only sees a maximum voltage of the battery, which is not enough to pass the diode. 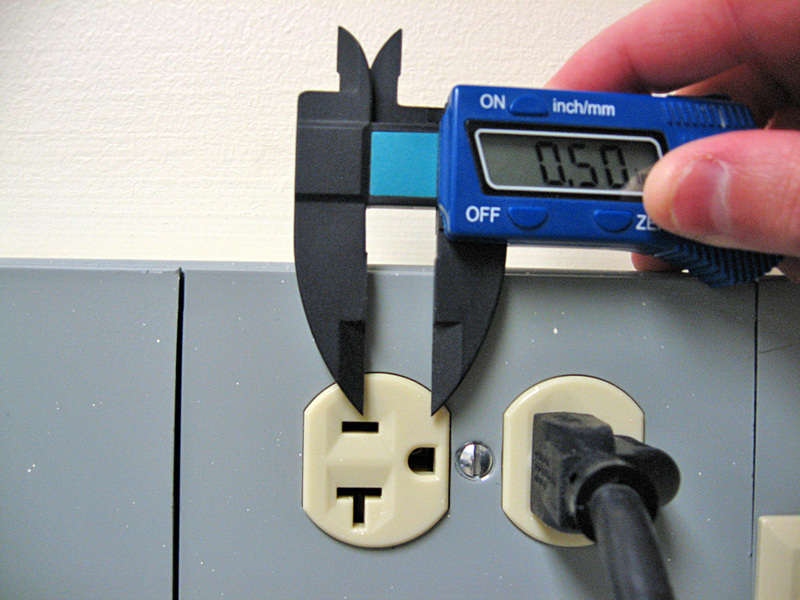 Once the inductor is charged, the battery voltage appears at the base of the transistor, turning it on. This allows the right side of the inductor to want to dump the energy it has stored in its magnetic field as quickly as possible, and this gives us a high-voltage that appears across the inductor. When that voltage exceeds 2.8V the LED turns on and lights up until the voltage drops below, triggering the sequence to begin again. I measured the frequency of the on/off oscillation and it seems to run at about 34kHz; the multimeter said between 68 and 72kHz but a radio showed there was 34kHz signal as well, which I assume was the fundamental (and the 68kHz one a harmonic). It did change in frequency a bit while on. Las Vegas received more rain last week, 1.69 inches, than it did in all of 2009, when it received 1.59 inches. The "average" is about 4 inches annually. If the rains continue into a full El Nino style winter, the area will bloom green in spring with the normally brown/gray mountains turned into green. I liked it better than some of the other animations I've seen of the same object, since he didn't center the object on every frame but let it move to the right. This gives the effect of it speeding up.